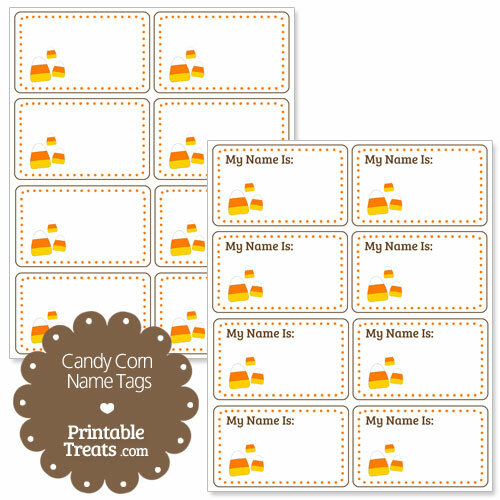 Here is a cute free set of candy corn name tags you can download and use for a Halloween event. These candy corn name tags feature three candy corn images in the corner of a rectangle name tag. There is an orange dotted border on the inside and a brown border on the outside. There are eight name tags to a sheet and two sheets – one with the text “My Name Is:” and one without text. In the download you’ll receive a PDF version you can print and then hand write the names as well as the JPEG files so you can use an image editing program like Microsoft Paint to add in your own names in whatever fonts you’d like. If you would like to share the printable candy corn name tags with a friend, please send them directly to this page (Do not link directly to the download file.) so that they can download a copy for themselves.